Psychological Thriller "Friends Don't Let Friends" takes a steady fast-paced approach to telling a story with many twists. Gravitas Ventures' "Friends Don’t Let Friends" was released on Nov. 28. As an indie film this was enjoyable and well worth the watch. The cast does a good job acting through this story which can stretch logical thinking and at times switches to random conversation topics between characters. 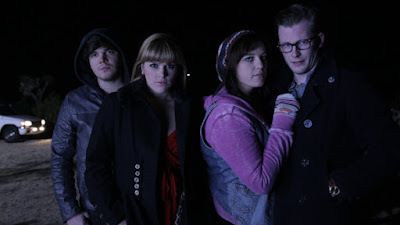 "Friends Don’t Let Friends" stars Jake White (SYFY’s "Children of the Corn" 2009), Brittany Anne Woodford ("A Family Man" 2016), Jenny Curtis ("Any Bullet Will Do" 2016), Brendan McGowan ("Sweet Darling" 2016) and Kanin Guntzelman (NBC’s "Southland" 2013). The dialogue can be a bit jarring as it seems to throw around one topic after another and stretch the logical connection between topics. Each character keeps their personality distinct and even with the strange dialogue, it seems believable that that each personality would be acting the way they do. Not to give away any spoiler, the explanation of the differences in each friend or member of the group gets explained well by the end. The ending seems to bring the entire story together and make sense of some of the weird parts of the story. The story may at times feel jumbled as well or that the scenes may not fit together just right, but that is actually what makes the ending connect. Not everything is explained in the story, but not everything needs to be. The ending leaves the audience wondering what will happen next and the ending, although it wraps the story up well, keeps the audience's attention to the very end. The shooting style is a bit shaky, but not enough to be an issue with audiences. The voyeuristic way of framing the shots can help audiences feel as though almost being another character in the story. 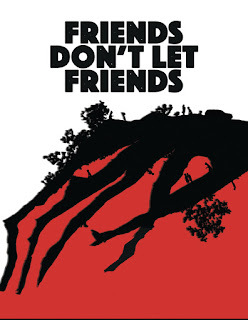 Overall, "Friends Don't Let Friends" is worth watching. Indie films, like this one, should be supported because its well thought out and the joy of making the story come to life can be seen in the end result.